After coming across a few sites that were serving pharma spam to Google Bot but not regular browsers, I thought it would be fun to give Sinatra a try and come up with a quick web app that checks for cloaked links. That lead to a few more checks, then some improvements, and Is it hacked? was launched. I’ve got some ideas for where I want to go with the project, but in the meantime it’s catching stuff that other sites in the space are missing. There’s also a bookmarklet at the bottom of the page. You can drag it to your button bar and check the site you’re on for any infection. Update: I’ve sold the site to someone else and am no longer involved. Capistrano is a deployment framework for Rails, though it can be extended to do pretty much anything. The system comes with a bunch of built in tasks, and each task can be made up of other tasks and code. Plugins can add their own tasks and hook into default tasks, and the user can do the same through the configuration files. Like any popular open source project capistrano has gone through changes. Documentation on the Internet is plentiful but often refers to old ways of doing things, so copy/pasting recipes can often result in stuff that doesn’t work quite right. One common thing people need to do is to run some command after the deploy or at some time during the deploy. Capistrano has a very easy way of doing this. This says “after running deploy:update_code, run deploy:symlink_shared”. The latter is custom task that’s defined elsewhere. The problem comes in when you look at the way the “deploy” and “deploy:migrations” tasks differ. I’ve seen a common problem where something works when deploying without migrations but not when migrations are used. Usually this is because the hook used is not the right one, either because of bad information or the user figured out where to hook into by looking at the output of a deploy. If you look at Capistrano’s default deploy.rb you can piece together the tasks that are run in both cases. From this, you can see that the sequence is somewhat different. The “update” task isn’t used in the migrations case. Instead, the components are replicated. update_code to run before/after the code is put into the release directory, such as if you want to make more symlinks or do something before migrations are potentially run. create_symlink to run before/after the symbolic link pointing to the current release is made. Note that symlink is deprecated. You can run it from the command line, but if you try and hook in to it, you won’t be happy. The Unix shell has a whole bunch of features to make your life easier. One has to do with the history. Some I have managed to ingrain into muscle memory, others I have to remember which often means I do it the long way. I hope these examples help you out. There are a lot more, run a man bash and look for the section called HISTORY EXPANSION. I’ve long been a fan of MixPanel and was happy that I got to get to use them again over at Wave Payroll. Last time I used them you could only track a page view, but now they have added track_links and track_forms which fire the event asynchronously after the link is clicked or the form is submitted. I started off by using the event_tracker gem which only handles the page view events, but it does make it easier to fire events in the view based on controller actions so it is well worth using. I talked to the author about adding support for track_links and track_forms, but after a good discussion he convinced me that the gem was not the right place for this and that I should pursue something more elegant such as tagging the links. One problem is that not all the elements had IDs and I didn’t want the added friction of having to add that in. So this simply finds all the links with the track-with-mixpanel class, assigns them a random ID if they don’t have one, and then calls the appropriate mixpanel function on them. The first is that the data-properties doesn’t quite work right. Pulling the data into a hash requires some finesse that I haven’t been able to figure out. One of my favourite applications on my Mac is Quicksilver. It’s an application launcher that can be extended to do almost anything. I’ve been able to set up hot keys to rate songs in iTunes, and also set shortcuts to URLs. These screenshots explain how to make a “jira” shortcut that will take you to a particular issue in JIRA. The instructions will work equally well for anything where the URL is well known. For example, ticket PR-139 is at https://mycompany.atlassian.net/browse/pr-139. To go there, you’ll hit your Quicksilver hot key (e.g. Control-space), then type “jira”, enter, then the ticket number, and enter. First, make sure the Web Search Module plugin is loaded by checking the box in the plugins menu. Then, add the shortcut to your catalog by adding it as a custom source under Web Search List. The name is whatever you want to type when first opening Quicksilver. The url is the URL you want to go to, with the dynamic part replaced by ***. You may have to rescan the catalog from the main Quicksilver menu. I just wanted to mention that I’ve started a podcast over at LinuxAdminShow.com. It’s me talking to a guest every week about issues that matter to the Linux administrator. The first episode was about systems management and admins-who-code, the second was about SSL. Always looking for feedback and guest/topic suggestions. Have a listen and let me know what you think! Update - if you sign up through this link, New Relic will send you $25 gift card for trying it out. Like many Rails people, I use New Relic to monitor my Rails app. At Wave Accounting we even pay for it. It’s well worth the money, as you get a lot of extra visibility into your app. At the standard level, New Relic is pretty good, but sometimes it seems like I’m missing out on something. RPM will show me that a controller is running slowly but most of the time is spent in the controller itself, not really saying what’s happening. I’ve recently discovered a few tweaks that have made a huge difference. It’s pretty embarrassing, but this isn’t on by default. It’s so simple to figure out how much of your time is spent in GC, the only caveat is that you have to be running REE or 1.9.x. This doc explains how, but all you have to do is turn on the stats and New Relic does the rest. There’s a wealth of information here. Your controller does a bunch of stuff but New Relic reports it as one big block. block tracing to the rescue! Then, these blocks will be counted separately. You can also trace custom metrics, such as user signups or report views. I’m still working on that, along with monitoring background jobs. I’ve wanted to play with the Twilio client for a while. They have this great quick start but it’s written in PHP. Now I don’t mind PHP, but I prefer Ruby. If I’m going to write anything using the client, it’s going to be in Ruby, so I don’t see the point in learning it on PHP. So, here is the meat of the quickstart done up as a Rails 3.1 application. Run bundle install to add the official Twilio gem to your bundle. Those are the magic tokens that let you authenticate yourself to the Twilio API, and more importantly for them, let them bill you. Yea, you could have put the code right in the layout, but I like sparse layout files. Then add root :to => ‘client#index’ to config/routes.rb so that your new view is displayed in the root url. 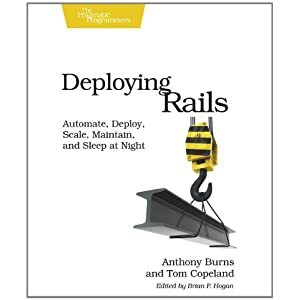 Run rails server or whatever you do to start your dev instance and browse to it. You should get the usual “find me in app/views/client/index.html.erb” message. Check the headers to make sure the library is being installed. The rest of the examples then deal with app/views/client/index.html.erb and app/helpers/client_helper.rb. For the second example, you just change the view. Don’t forget to add post “client/incoming” to config/routes.rb. Then point your sandbox URL to your dev box, such as http://yourhome.com:3000/client/incoming.xml. desc "Start a ssh tunnel"